- We devote ourselves to provide quality, professional and inexpensive gardening products to our customers. - We also think highly of customer service, 60 days warranty is guaranteed (defection, accidental damaged, non-satisfaction). - Contact us at any time you want, it's our pleasure to serve for you. - Notice: Small size plant pot, only for miniature succulent or cactus. - Pack of 1; Dimension: 3.8 x 3 x 3.9 inch / 9.8 x 7.7 x 9.9 cm (L x W x H). Small Ceramic Plant Pots - Perfect for holding miniature succulent, herb and cactus plants. 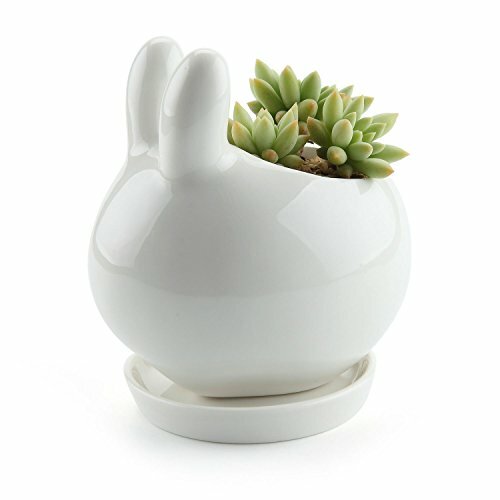 Bunny Rabbit design - Ideal for windowsill and office table decoration; Perfect Gift for Wedding, Birthday, Christmas, etc. A small Drain Hole on the Bottom; Pack with Porcelain Tray. Pack of 1; Dimension: 3.8 x 3 x 3.9 inch / 9.8 x 7.7 x 9.9 cm (L x W x H).